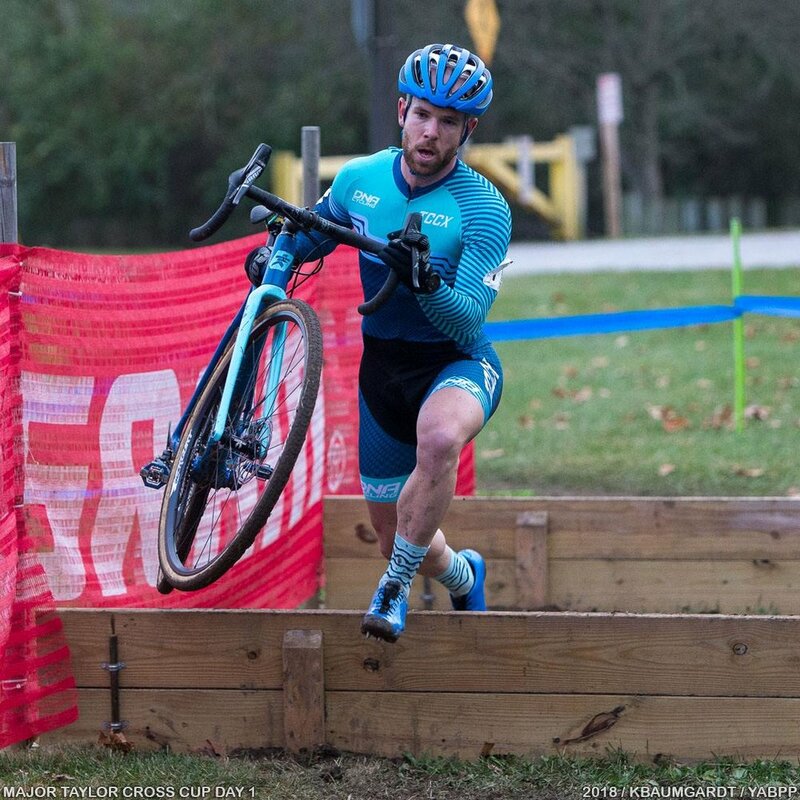 The month of November presents a split in the trail of the domestic cyclocross season. 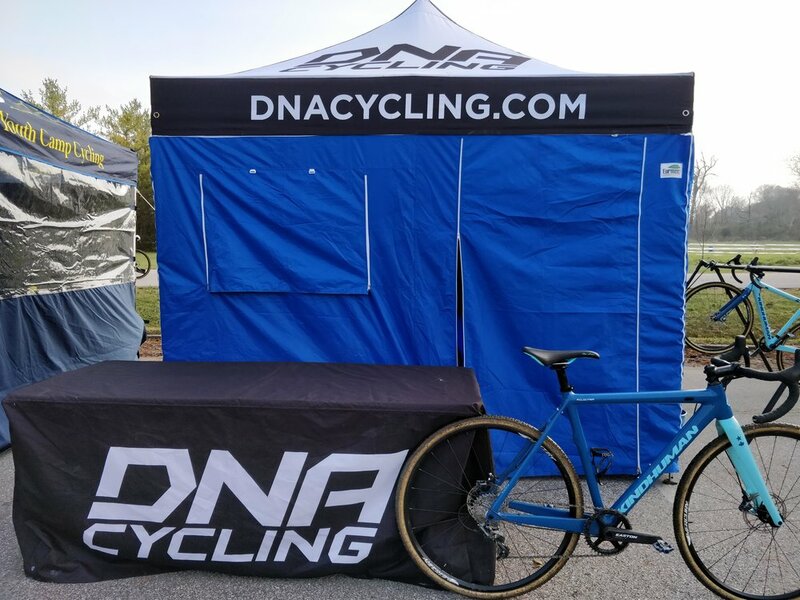 With Nationals fast approaching, racers are presented with a multitude of options for racing each weekend. As I surveyed the options available to me, I decided to head back to the Midwest for the Major Taylor Cross Cup on the campus of Marian University. The race provided a great opportunity for points and results in a deep field. But my biggest hope, was that the weather would be drier than the 2017 edition. Cleaned up from the racing in Massachusetts, I was able to get some good training on familiar roads at home. Being that the cross season is so compact, it’s hard to find time to fit in proper training between the weeks of racing. With sunny, albeit cold, weather all weekend, I rolled out with my friends Nicholas and Ryan. Feeling properly exhausted and happy, I decided to take advantage of the day off for Veteran’s Day and head up to the Midwest before rolling down to Indianapolis. I thought it was cold in Texas, but Michigan was coooold! 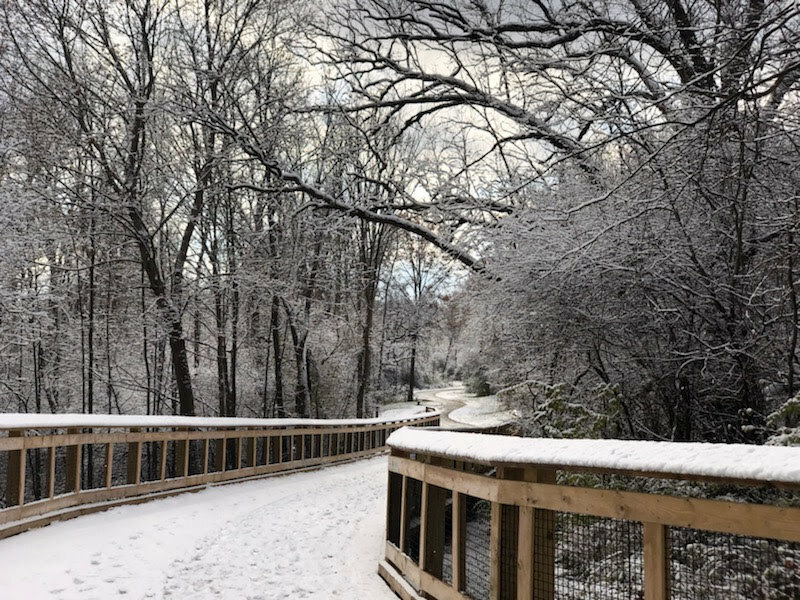 Temps in the 30s and some snow on the ground gave me a chance to practice my layering strategy for the cold races to come, and get some experience riding on snow. With Louisville Nationals looming on the December horizon, it’s never too early to start preparing! After a few solid rides midweek, it was a short trip down to Indianapolis to check out the course and see my good friend Hugo. The course itself was very similar to the previous edition. 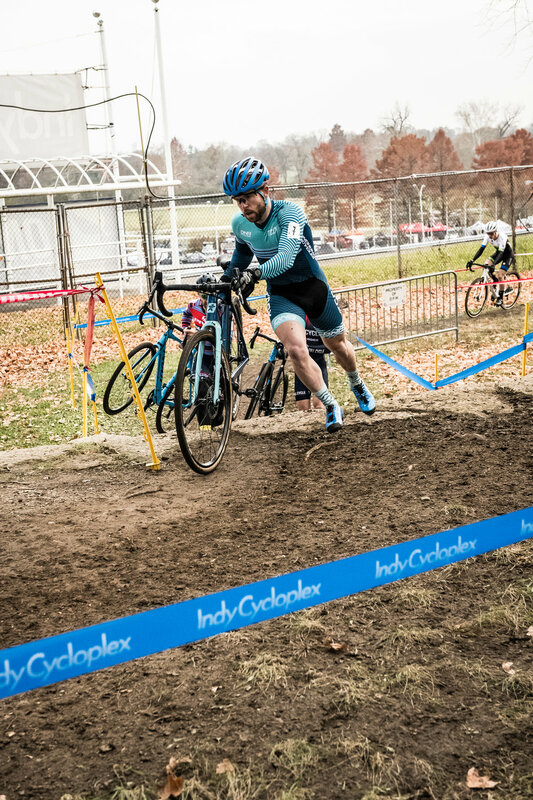 After starting on pavement, the track traverses a lower field section, with sweeping turns and a few tricky off-cambers before heading past the Indy Cycloplex and up the steep hill behind it. There the course gets more technical with rooted off-camber turns, a couple of fast and tricky descents, and a run up/ ride up section. 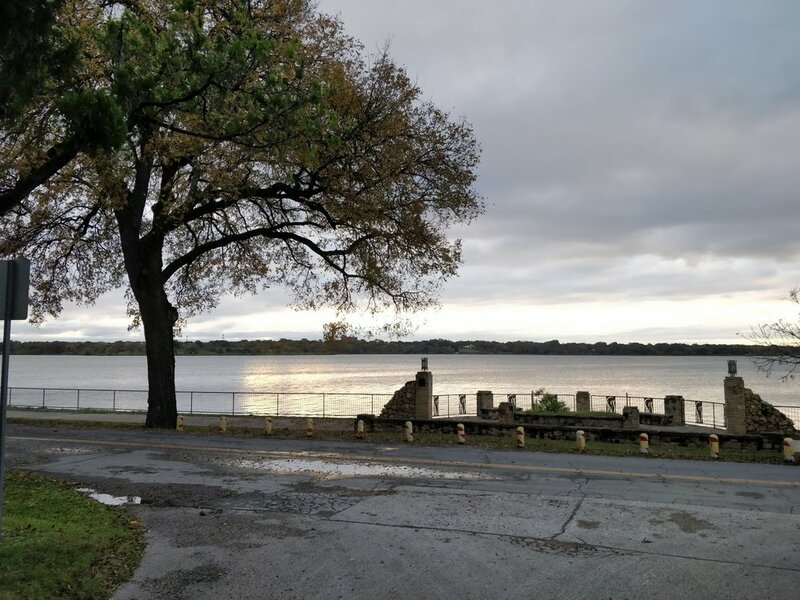 I took a couple of laps on course to re-familiarize myself with it and then did some opener efforts on the trainer before heading to Whole Foods for the traditional race weekend dinner. The conditions were still greasy and soft when I got on course around noon on Saturday. Wintery precipitation earlier in the week, and a cool damp morning made for soft ground as the morning races got under way. Ruts and lines zig-zagged all over the turns, making it all the more difficult to navigate at speed. 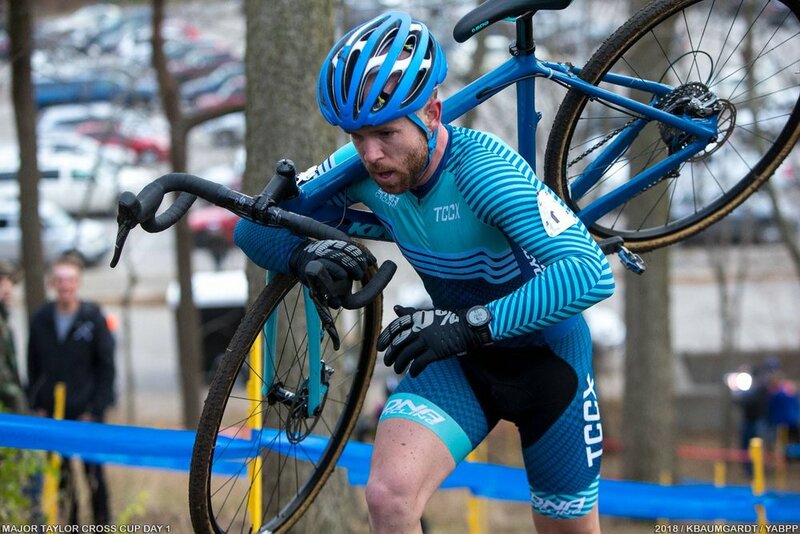 The risk of slipping or getting cross-rutted (when you’re in one rut and then suddenly get caught in another that takes you off your intended track), was real. The field was a strong one. My culmination of UCI points was enough to land me on the front row of the grid, but there were plenty of riders behind me that were capable of being in the front group. The whistle went and I was quick off the line, making my way toward the front of the pack. Through the first sweeping bend on the dirt, I got caught on the outside line, losing more than a few spots in the peloton. I pedaled hard and unapologetically moved my way back to a spot inside the top 10 as we passed the pits for the first time. I was feeling good and mentally I was focused on the effort in front of me. The group started to splinter over the first two laps, with Drew Dillman (SDG Factory Team) setting a blazing pace off the front. I was still in a good spot, inside the top 10 as we made our way around for another lap. Knowing that the track required a constant application of power, I was content to follow wheels and not throw any punches at the front. We crossed the line again and it was in that moment that disaster struck. As I set up for the right-hand sweeper after the start finish, I went to shift to an easier gear but got nothing. I hit the paddle again and instead of shifting down, I was suddenly in the 11t, my hardest gear. Standing on the pedals with all of my body weight, I tried again and again to find an easier gear. But all the effort proved fruitless and I was left muscling the big gear through the open field, half a lap to the pit. I finally made it to the pit and grabbed my B bike with Hugo and Chandler. Back to a normal gear, I started my pursuit to get back to the group. Unfortunately, that pursuit would have to wait as I was hit once again with more shifting issues. It was another lap and a half until I made it back onto my preferred steed. Having lost a handful of spots, I mashed on the pedals to pick up more spaces. There was a moment or two when I felt down and out. To be hit with mechanicals two race weekends in a row, was a big blow to me mentally. I knew that I had good form and that I belong at the front. And when things outside of your control start to affect your result, the negativity that begins to stir in your mind can be overwhelming. 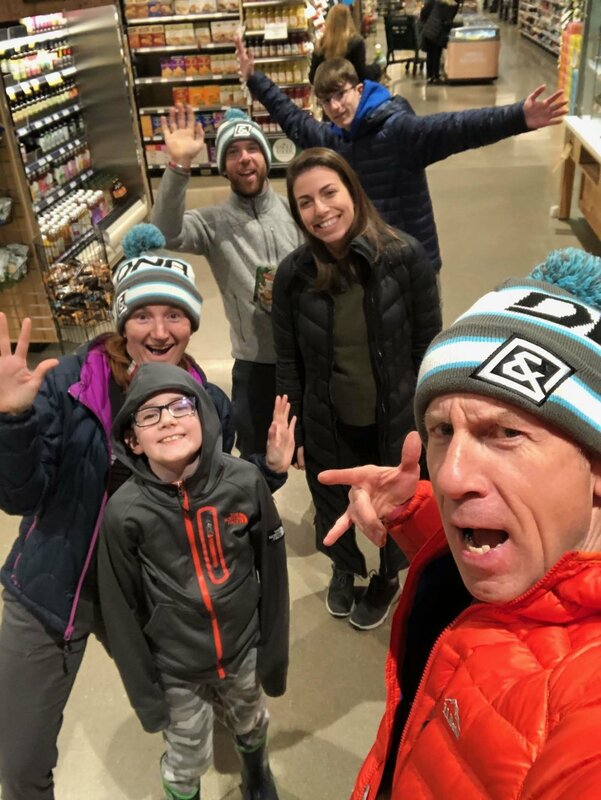 Fortunately, I had my cyclocross family with me and they reminded me that all I could do is hit the ‘reset’ button and move forward. Eager to get back in the points, I started catching riders and then pedaling past immediately. With two laps to go, I was just 14 seconds back from a group of two, battling for 9th and 10th. I would catch a glimpse of the duo each section of the course. It was enough of a carrot to keep me on the gas. One lap to go and I had made a small four second dent into the group in front and was sailing clear in no man’s land in 11th place. I started to look ahead to day two and let off the gas a bit as I cruised through the last lap to finish just outside the points. I was frustrated but satisfied. That taste of blood which accompanies such a hard effort served as a sign that I had given it my all. The only thing that I could do now is get recovered and make sure my bikes were in good shape for the next battle. After a wonderful evening out with the Ann Arbor Velo Club, I was feeling good about the racing ahead. The course remained unchanged from the day before, save for one minor re-route at the top of the hill. The conditions were unchanged as well, and my confidence started to grow as I could take my same lines from Saturday’s race. All was well! The whistle went and it took me half a second to get sorted in the pedals. 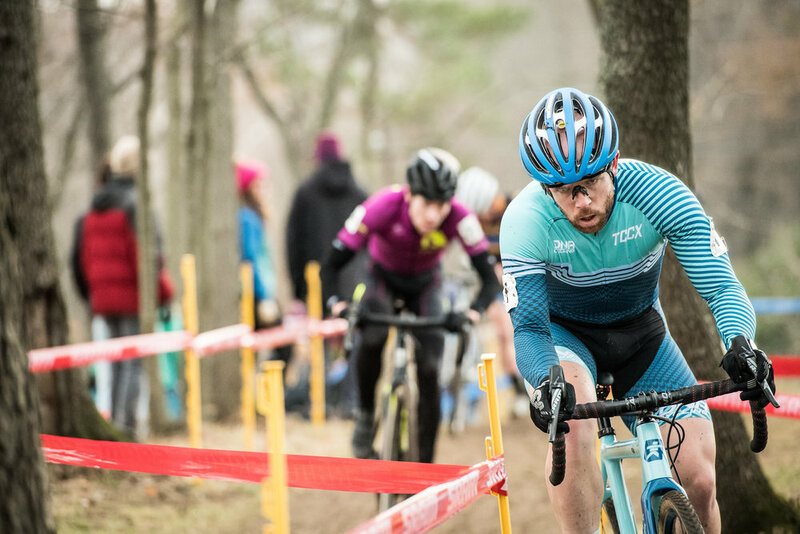 Shuffled back a spot or two, I tried to make up some ground and move my way to the front but came up against Eric Brunner (FCX Elite Team) bumping bars and shoulders. I backed out a bit and elected to find another way closer to get up towards the front. Through the first turns, I took no prisoners, moving up and taking my lines to move up in the bunch. As we hit the hill, the group strung out into one long line. I pushed my way in front of a few riders but had to unclip as my line on the 180 turn was too close (FYI: No, I did not call out “on your left!” and people were fine with it). Jamey Driscoll (Pivot-Maxxis p/b DNA Cycling) ran up on me, but at first check everything seemed well with both of us. We came through on lap two and I was leading a group of six through the start finish, competing for 9th to 14th. Attacks were thrown and engines were blown, and eventually the group whittled down to a few riders. I caught up to Troy Wells (Clif Bar) and rode with him through the bog. As we hit the hill, Troy hit the gas and accelerated away from me. I kept the gap close, but as we came through the start/finish line, I found myself sliding across the ground. As I rounded the first turn, I found the limits of my tires and hit the deck. “Patience over panic” I thought to myself. I pulled myself up off the ground, checked my bike over, remounted, and got back on the horse. I pushed myself to ride smooth and fast, and with some luck I was able to catch up to Troy. Wasting no time, I went straight to the front and went hard. I turned the screws up the hill and again as we hit the run up. Remounting at the top, I stole a quick glance and realized that the elastic had broke and I was in solo 11th place. With eyes forward, I kept pushing and as I passed the pits for the second time, I could see Allen Krughoff (Chocolove Specialized) ahead of me in 10th. Now the fire was burning bright, and I put my head down as I passed under the finish gantry for one more lap. I was sprinting out of every corner, working hard to close the gap. As we hit the hill, Allen’s wife Kathryn was there counting the seconds. It wasn’t much now and I reminded myself that I could make up the difference on the second half of the course. We hit the bottom of the run up and I heard a pop, very similar to the sound a chain makes. I dismounted and sprinted up the hill as fast as I could. As I remounted at the top, the gap was that much closer, but just then I heard an unfamiliar tinging against the frame. I stood up and accelerated to the next turn, assuming that it was just a stick that would work itself free. But as I thought more about it, I realized there was no possibility I could have picked up a stick along the run up. Dismount for the stairs. Remount. Still more tinging. I looked down again and realized that one of my spokes had broken. With a steep downhill and the Mindick Moguls in front of me, I decided to not go “Full Sendy” and save myself from myself. Safely down the hill, I passed pit two to see the gap opened up and realized that I would finish in a consistent 11th place. If I’m honest, I was frustrated to have another weekend where mechanicals affected the outcome of the race. I guess you can’t argue a hypothetical – i.e. if I hadn’t broken a spoke would I have actually caught Allen? – and at the end of the day, it is MY responsibility to ensure my equipment is dialed and ready to go. So while I could sit there on the plane home and pout about my situation, I decided to take the positives from the weekend and realize that I was able to put in two races that I was proud of. For me, that is enough. Thank you so much to Hugo & Chandler for manning the pits all weekend and letting me crash with them! 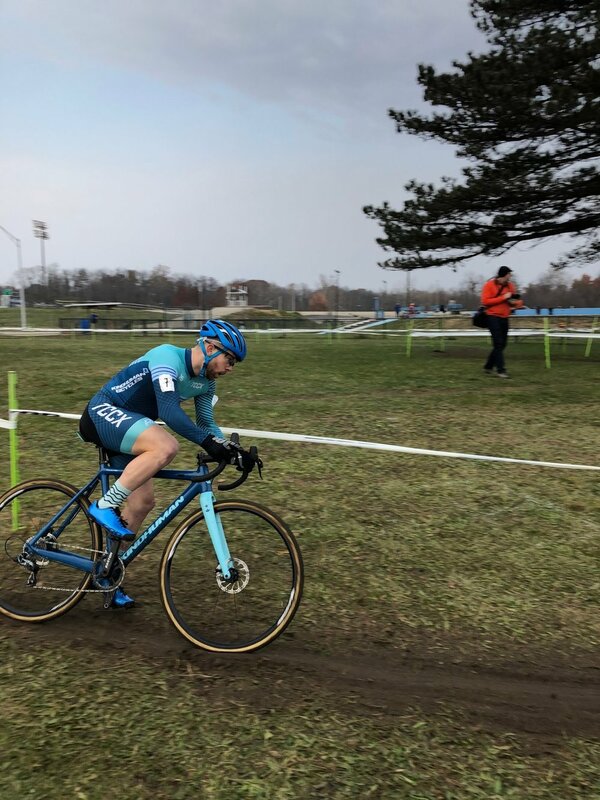 To Scotty D for transporting and checking over my bikes (saving me from myself), Scot Herrmann, David Palan, and the Ann Arbor Velo Club for their cheers and support! And to my cyclocross family, for supporting me and keeping me in check with the appropriate perspective at all times. Next up is some Southern ‘cross here in Dallas at the Resolution Cross Cup and Ruts N Guts in Tulsa, Oklahoma! All good vibes heading to Nationals!